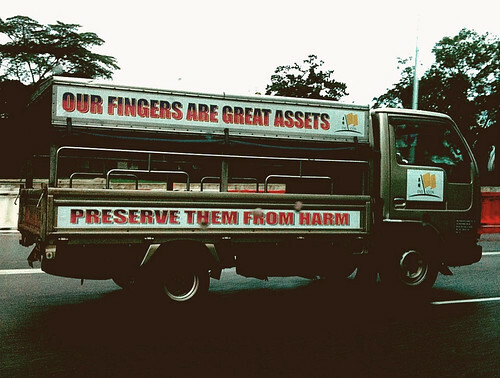 This lorry drove past the cab I was in yesterday and I have no idea the type of business the vehicle is working for but, “Our fingers are great assets. Preserve them from harm”? Right on, you savvy little lorry. You’re onto something wise. I was completely exhausted from a long sleep-deprived day at work but let’s just say if you knew me well, you’d have seen the smirk on my face after reading the well-crafted message.